This post will summarize October's performance. Markets were rather volatile in the last several weeks. Recently the markets have been recovering from the October declines. The consumer staples and defensive type names have been performing well. I have noticed stock sectors that I hold large positions are doing better now and sectors that I hold less in (more cyclical ones) are getting cheaper. This is a change for the better for me as I am now able to diversify into other categories by buying stock at better prices. Previously, the consumer staples and defensive names have largely lagged the cyclical high growth companies like Technology and Industrials. In October I received sizable one time distribution from my vocation. There will still be one last non-reoccurring payout happening around end of November. I still have not identified how I will invest all this cash, so these monies are sitting on the sidelines. I have zero debt so all this cash will be invested into asset classes that pay income. The portfolio value also saw a shoot up as markets recently have been recovering. These two factors caused October's sharp shoot upwards, almost hitting $600,000. If market circumstances remain flat I believe I can achieve the $600,000 target before New Years which will be a good boost towards my goal of $1MM. At this point in time, my portfolio is getting large enough that market movements dominate day to day changes. The contribution from my re-occurring income does not help so much propel the portfolio forward. 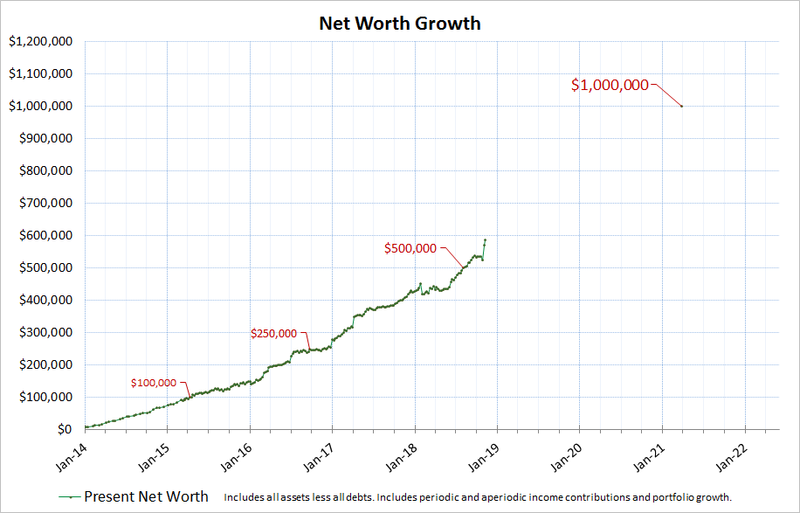 From $600,000 to $1MM I am expecting my portfolio will help perform much of the lifting while my periodic income contributions are there to help buffer against market declines. The $1MM timing target is quite ambitious, if the growth is purely relying on my periodic income contributions I think it will be impossible. That is why I have weighed a decent chunk of my portfolio in high growth companies that pay less dividends. As a result, my average portfolio dividend yield is less than other dividend investors who emphasize high yield. 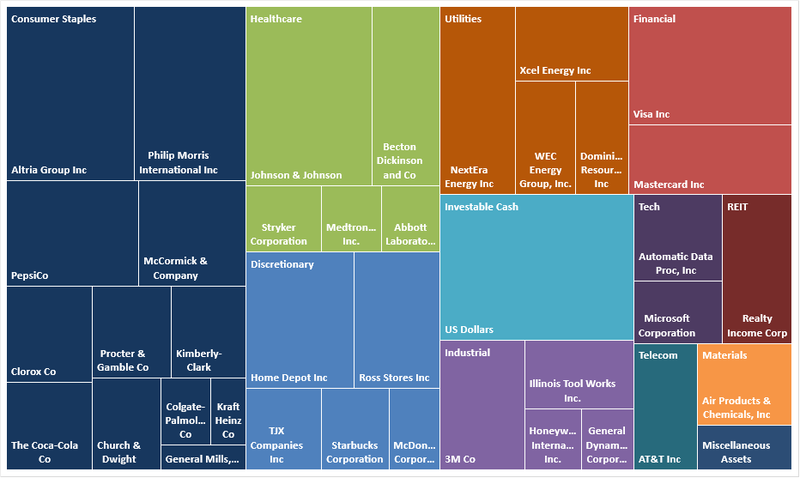 Given my age, I think having a large emphasis on higher growth lower yield companies will pay large dividends in the long term after these growth companies have grown much over their starting cost basis. As of today 11/11/2018 my portfolio sits at $588,000. My largest position now is JNJ. There have been several spinoffs from Honeywell so I still hold those (REZI and GTX). I think in a few weeks my cash position will start to approach $60,000. If I cannot find good deals then I will likely just spray that money proportionally on all my positions like an index fund. Timing the market is not something I am very good at and I prefer to deploy money when it's ready to be deployed and harvest the additional income added. I am not too worried about timing at my age as I am still in the accumulating stage. My income from vocation will continue to come in so bad timing will be offset by future good timings (i.e. following a dollar cost averaging philosophy). The graph below shows how much annual income my portfolio will generate on its own in the next 1 year. The graph trend had a spike upward last month. This is because I deployed around $15,000 in cash. I still have $45,000 right now waiting to be deployed. I expect my forward annual dividends to get close to $16,000 annually before the year ends. 2018 has been a good year so far with record dividend increases from the companies I have held (the tax cut really helped) and larger income from my job. 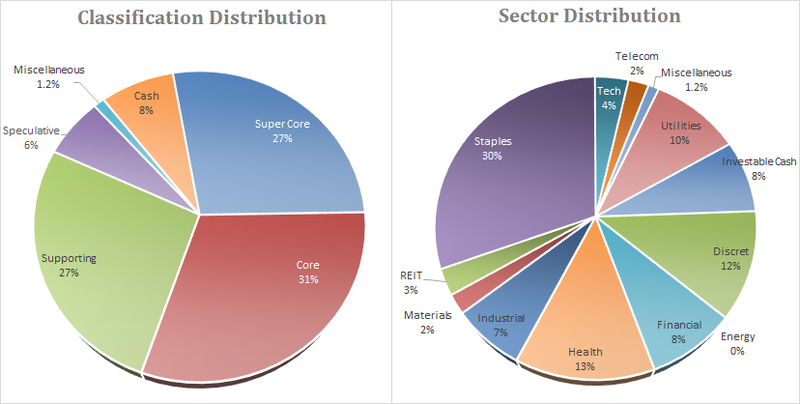 Here is the current distribution of my portfolio categories. I tend to emphasize less cyclical businesses with higher dividend payouts. These type of businesses do not grow as quickly when the economy is good but they help protect the downside. My preference is on capital preservation and protection of the dividend so I am more conservative. I do not need to leverage hyper growth companies with larger risk because I believe my income from my vocation will help me achieve my yearly targets. If my income was not at a level that I can rely on, then I will be forced to take on more risk to achieve my goals. As you can see in the picture above, there is a big rectangle for Investable Cash. I need to find a way to deploy that somewhere as it's generating nothing at the moment. It is good to have some cash on the sidelines for emergency and opportunity but too much can be a bad thing. Cash is similar to a company that is not growing and having no positive earnings; if looked at in those "equity" terms then cash can be seen more negatively. NICE JOB!! 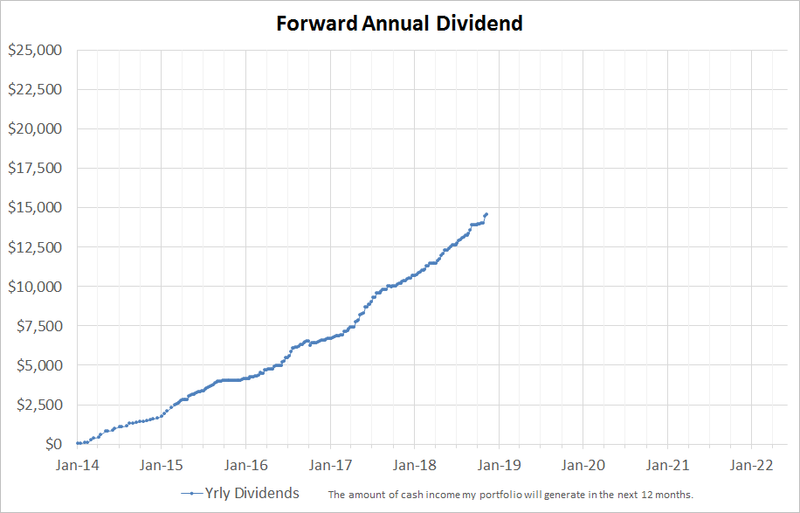 Crushing it - that forward income goal is awesome and love the "heat" chart you have on the dividend stocks, very helpful. I'm trying to research stocks today and not sure which one appears undervalued. Onward and upward!